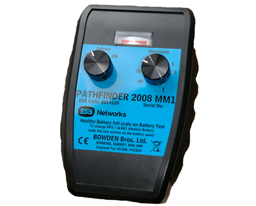 The Pathfinder 2008MM was developed by Bowden Bros to satisfy the requirement of ESB Ireland to find single phase faults on their 10KV Isolated Neutral System with Earth Fault tripping. The Pathfinder 2008MM is a highly sensitive instrument that will detect the direction of flow of capacitive currents at the time of an earth fault. The capaitive current flow can be predicted before and after a fault from when the Fault Protection Earth (FPE) switch is applied, to when it is not applied. In this way the instrument can determine whether the operator is upstream or downstream of an earth fault, and enable him to locate the fault down to a small section. The instrument is held in hand under each feeder from the substation, and it will identify the feeder on which the fault is sustained, by indicating a difference in capacitive current flow. The operator may then check at various points on the overhead line, and will experience a difference in the needle response before and after the fault. In this way the fault can be tracked to the exact position.